The nominations are in, the charity donation payments have been made and the qualifying period kicks into action from today (Monday). The $28,000 City Of Palmerston North Golden Chase is now officially underway. 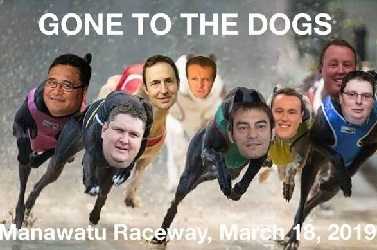 For the next six weeks 38 greyhounds will chase after final field positions for the 29 March event featuring four, two dog 457m match races at the Manawatu Raceway. This is yet another example of the innovative actions taken by the Palmerston North GRC as they form part of the tri-code City of Palmerston North Festival of Racing, which is now into its third year. The same City of Palmerston North trophy will also be for the Thoroughbred and Harness codes feature events. The qualifying period continues through to 18 March when the final eight greyhounds to contest the final match ups will be known following that day’s racing/trialing action. The 18 March meeting is also Commentators’ Day, where the races will be called by the bulk of the nation’s race commentators from all three racing codes. Greyhounds can qualify for the Golden Chase via 457m solo trails, however, to verify their series involvement, they must also contest a 457m race during the qualifying period. All solo trials will be held immediately after the last race is run each Monday, which will be the open class 457m event. Check out all the Golden Chase details on this website, including updates on the Golden Chase times’ leaderboard. “The Golden Chase is more about owners wanting to be part of the festival. It is our big day in the sun and people are coming from everywhere, including from Australia, to be part of it. The Palmerston club wants everyone to enjoy their involvement,” commented Paul Freeman who also advised that his club has enticed former Christchurch judge Peter Rosanowski out of retirement to judge the City Of Palmerston North Golden Chase meeting.